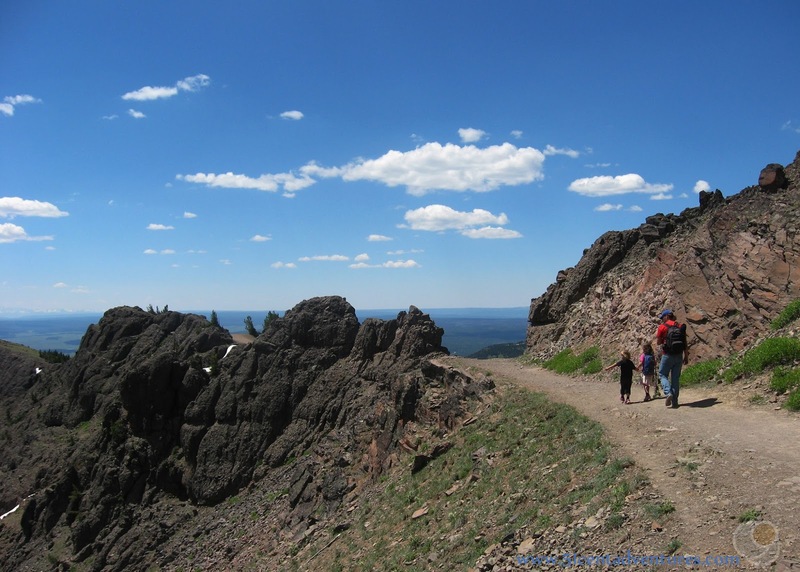 Location: Mount Washburn is located on the east side of the Grand Loop Road just 5 miles north of Canyon Village. 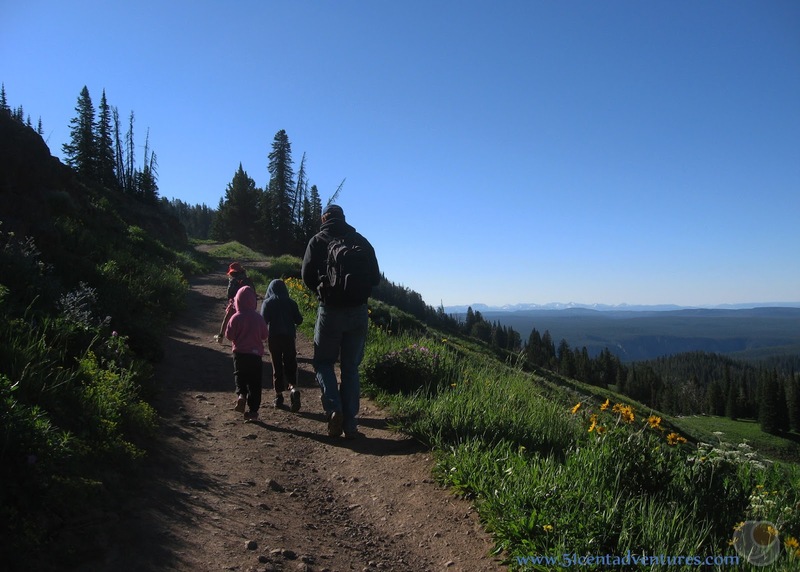 The trail head for the Mount Washburn Hike is located at the Dunraven Pass. There is another trail head located on the Chittenden Road. That trail is about one mile shorter. 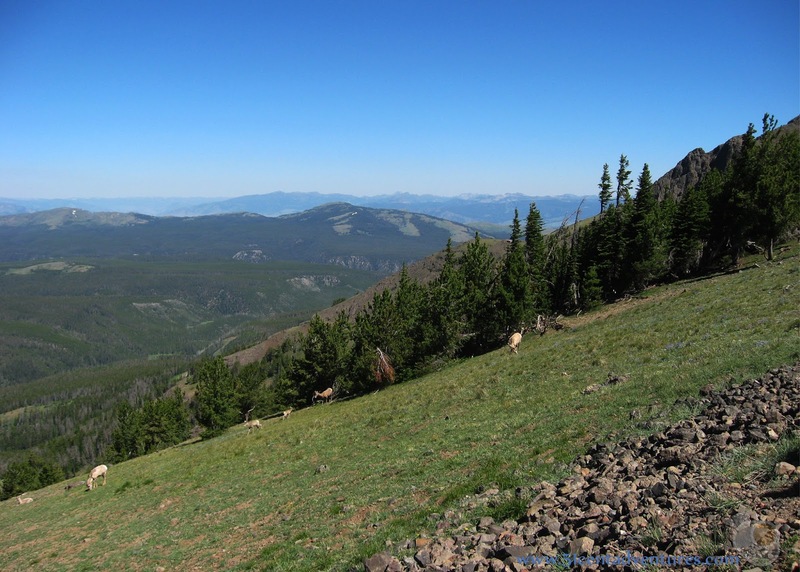 Hiking Distance and Time: This post focuses on the 7 miles round trip trail that starts at the Dunraven Pass. Plan for 3-5 hours. Do not start this hike in the afternoon. You will either run the risk of being caught in a summer rain storm or you will swelter in the heat. In the summer of 2017 I received a job with Xanterra Parks and Resorts in Yellowstone National Park. I moved there with my husband and our four young children. We lived in a 25 foot RV and spent all our free time exploring the park. This is the third of many posts that I will write about specific features within Yellowstone National Park. At first these aren't going to be in any particular order, but in a few months I'll start grouping them into lists. 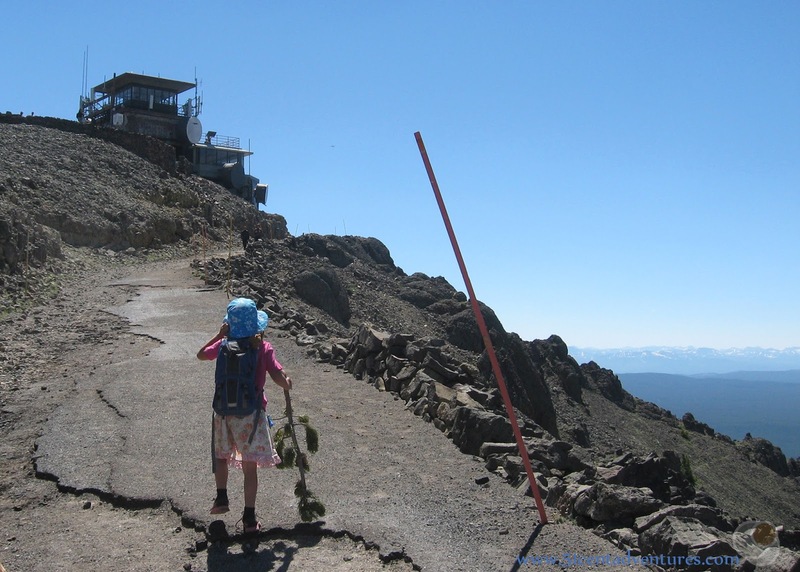 This one would probably fit into a list such as best back country day hikes. 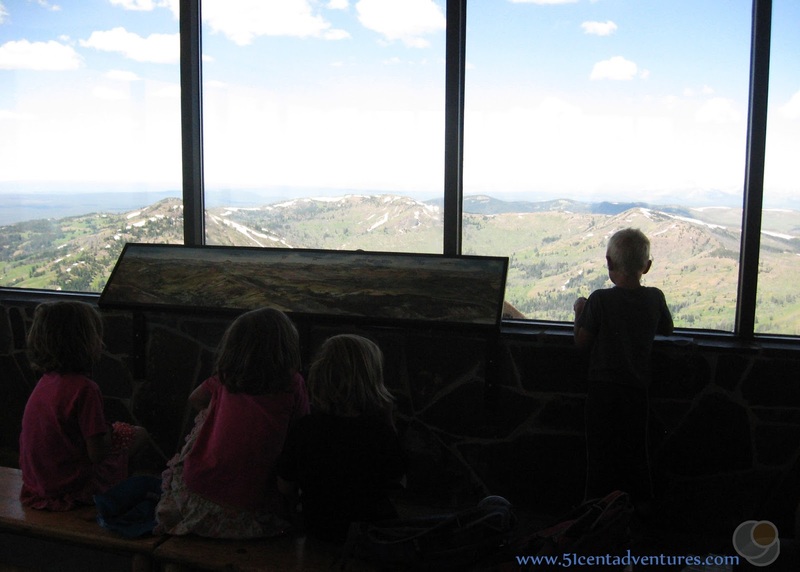 There is one feature in Yellowstone National Park that my family literally saw every single day. 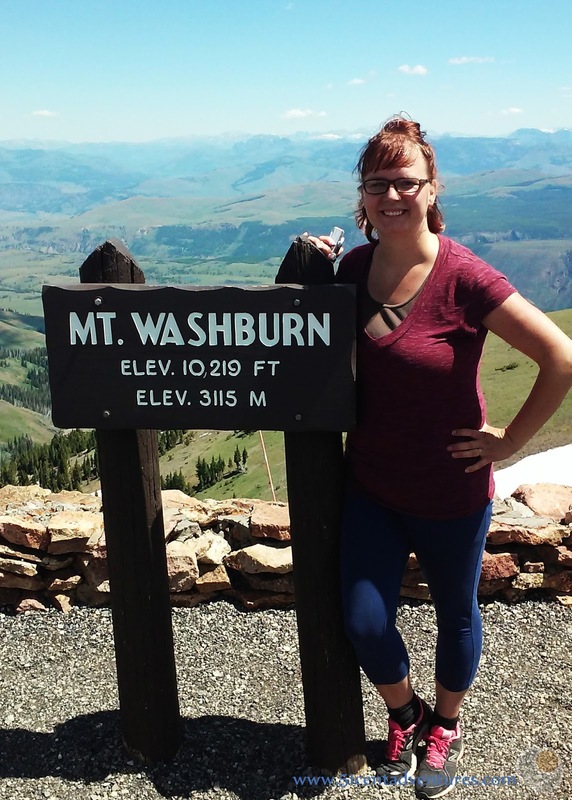 That feature was Mount Washburn. 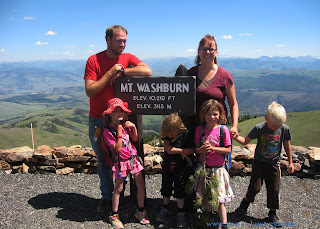 We lived all summer in Canyon Village which is directly south of Mount Washburn. 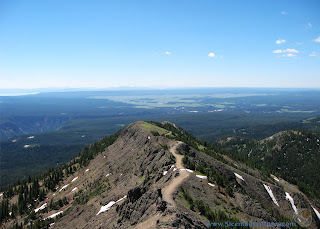 Every day we could see the summit of Mount Washburn above the trees in the distance. 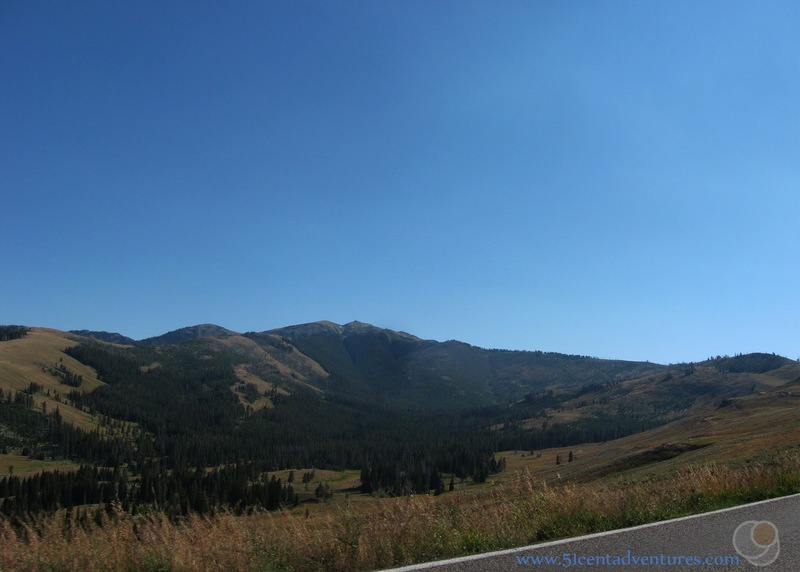 Halfway through the summer I started working at Roosevelt Lodge and so 4 days a week I drove through the Dunraven Pass which goes over the shoulder of Mount Washburn. I came to know every curve of the road by heart. Whenever we drove through the Hayden Valley or on the Norris-Canyon Road we could see Mount Washburn waiting standing as a silent sentinel near our home. We were so used to seeing Mount Washburn that I literally never took a picture of it from our Campground. It was always there, why would I need a picture of it? 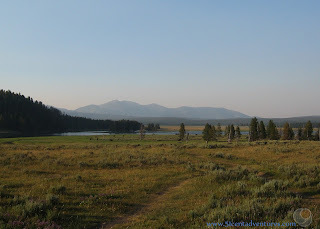 The best picture I could find of all of Mount Washburn is from the Hayden Valley. And here is a picture I took one day when I was driving back on the Grand Loop Road from Roosevelt. And here it is when snow still covered the mountain. 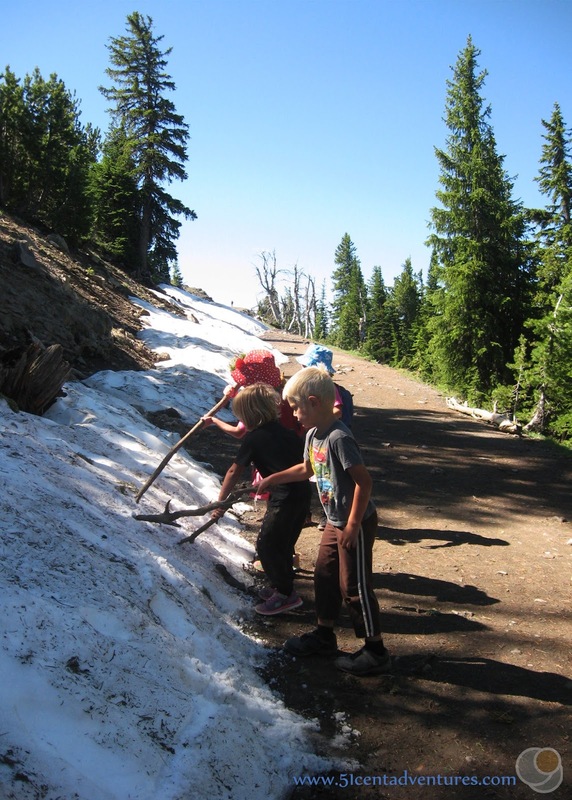 That snow is actually what made us wait so long to try to hike Mount Washburn. One of my co-workers climbed the mountain in mid to late June, but she told me that the snow was still pretty high and slick. I could just imagine my kids sliding off the mountain on that snow. So we waited until we were sure the trail was snow-free and dry. I wanted to make sure we made it to the summit because for years I had a goal to hike to the top of a mountain. Pregnancy and living at low elevations got in the way of this goal, but I'd made some decent attempts. 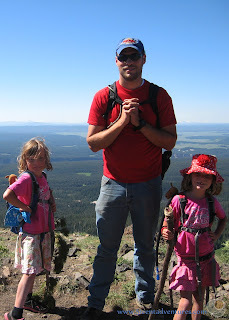 The closest attempt was when we went to Mt Evans in Colorado in 2012. 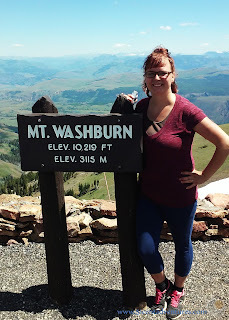 I'd given birth to my son about 3 months earlier so I was in no shape to climb one of Colorado's 14ers. I cheated and we drove to the parking lot near the top of the mountain and I only had to do the last 500 or so feet on foot. 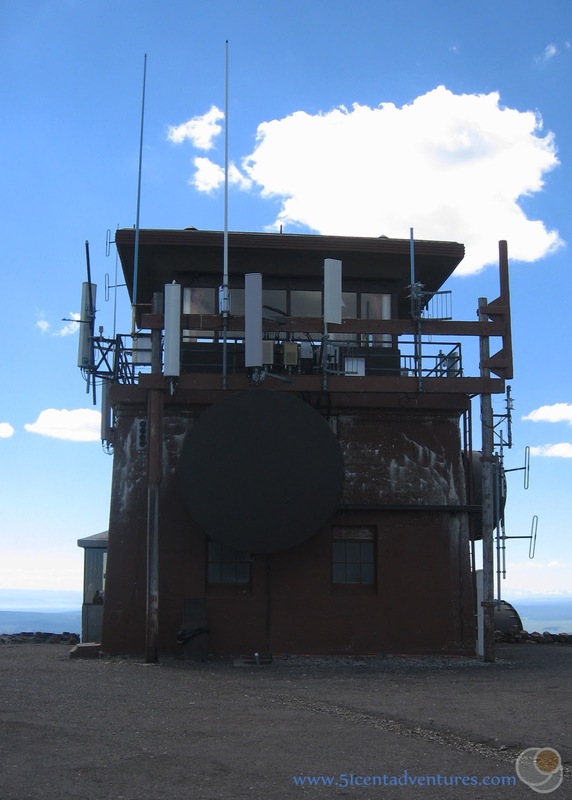 Another cheating summit was obtained in the fall of 2016 when we drove nearly to the summit of Clingmans Dome on the boarder of North Carolina and Tennessee. We'd only had to hike the last 1/2 mile to the top- though I should get double points for carrying my three year old daughter up nearly the whole way. And there were a handful of "mountains" in the south that I climbed. Most notably being "Mt" Bonnell in Austin Texas which rose to an impressive height of 770 above sea level. Hiking Mount Washburn seemed like the perfect opportunity to climb on a legitimate trail up to the summit of a legitimate mountain. I had my reservations though. The trip would be a total of 7 miles - which would be the longest hike the kids had been on yet. 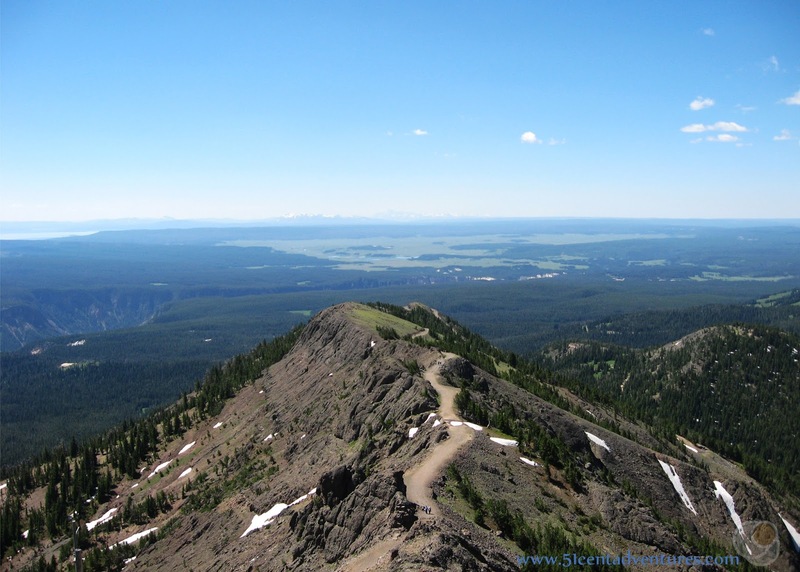 However, they'd done so well on the grueling, steep trail to the petrified trees that I was certain they would do fine on the long switchbacks on the Mount Washburn trail. 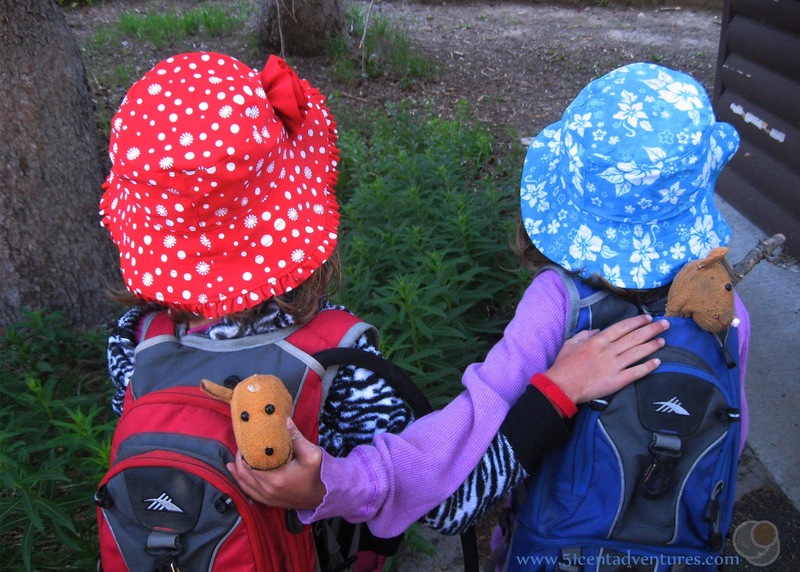 We started our hike on the morning of July 13th. 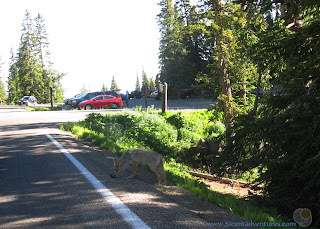 It wasn't that far of a drive from our RV to the trail head located at the Dunraven Pass. When we arrived we were surprised to see a coyote on the side of the road. I made sure to get a picture of him before he ran off. 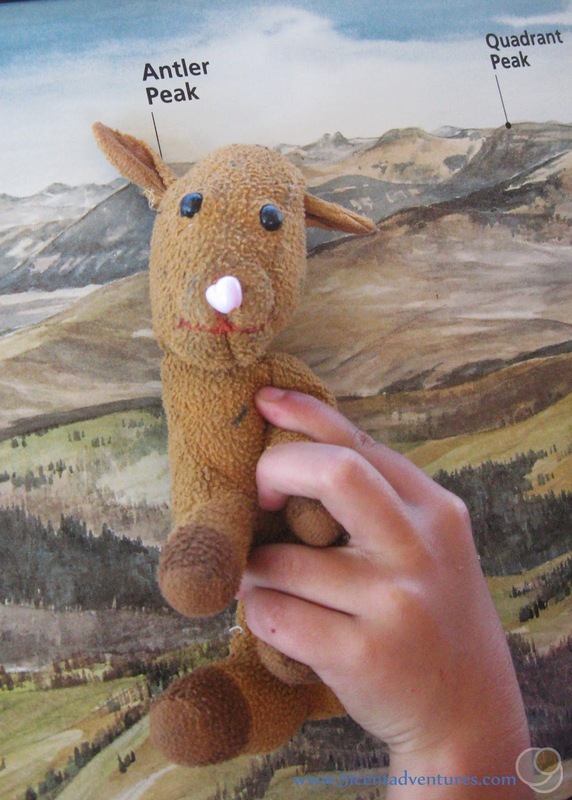 My six year old twins had each brought their little reindeer stuffed animals with them. One reindeer is named Antler even though she doesn't have any antlers, and the other is named Nose - though for a long time she was missing a nose. 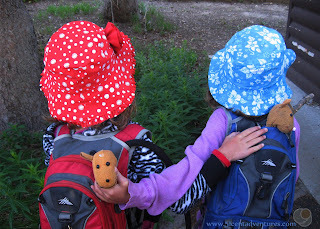 Antler is in the blue backpack, Nose is in the red one. The trail starts out on the south side of the mountain. 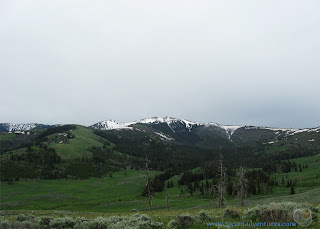 There were great views of the Grand Canyon of the Yellowstone. We could also see many wild flowers. As we hiked we passed some remaining snow. 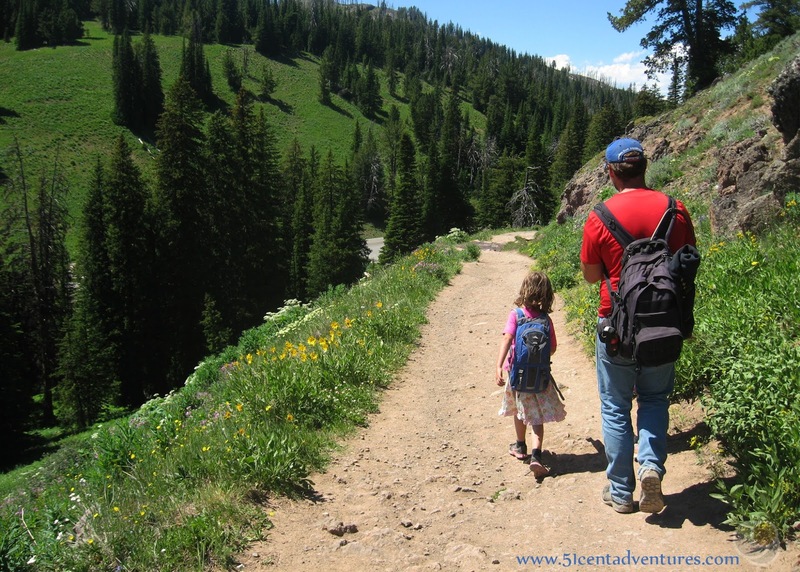 Earlier in the summer the whole trail had been covered with snow. The trail switched back quite a bit and never seemed too steep. In the park's early days this trail was actually a road for stage coaches and Model T Fords. As always the kids did great. We kept them going with snacks every so often. As we hiked we would catch glimpses of the lookout tower up at the top. This helped us gauge how much farther we'd have to go. 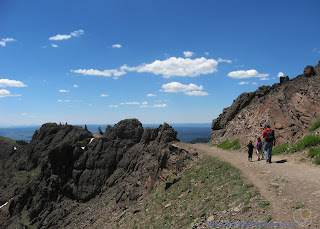 The final fourth of the trail was along a ridgeline. The drop offs on the edge of the trail were pretty steep, but the trail was wide enough that I never really worried about my kids. We were able to spot some Rocky Mountain Bighorn Sheep grazing in an inclined clearing. The trail met up with the Chittenden Road trail and then started winding up to the summit. It was something like a large corkscrew. 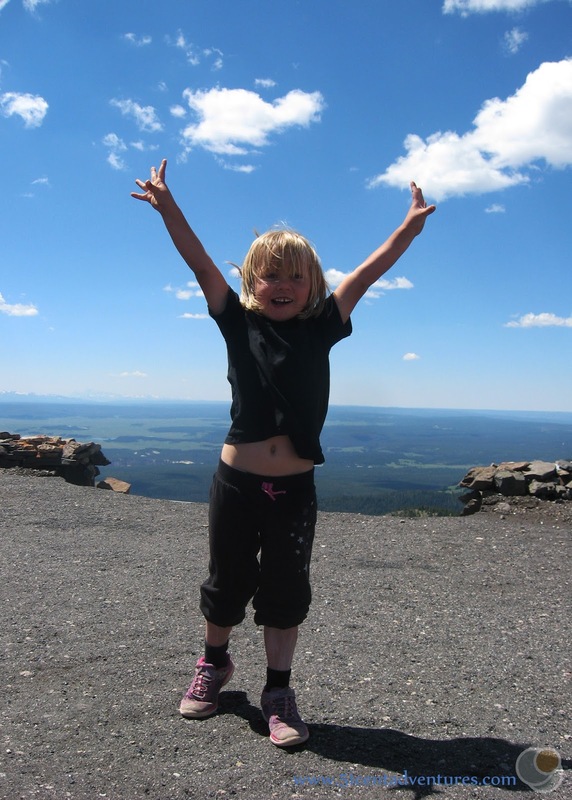 I was especially happy to have finally achieved my goal of climbing to the top of a real mountain. And check out my three year old. There is a big difference between a "just barely three year old" and an "almost four year old." The previous fall she insisted that I carry her to the top of Clingman's Dome. This year she summited a mountain without much fuss. We didn't have to carry her at all. Actually I'm not surprised, this girl is a force of nature and when properly channeled she has enough energy to do anything. The observation tower at the top was open so we were able to go inside to get a break from the wind. This building also had bathrooms which were much appreciated. 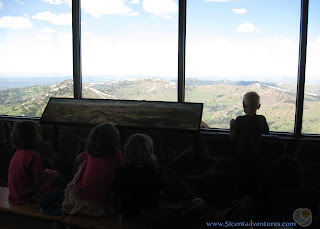 We ate lunch inside and looked out the windows at the impressive 360 degree view. I love this picture of the trail on the ridgeline that we'd hiked just a little bit earlier. This is looking south. 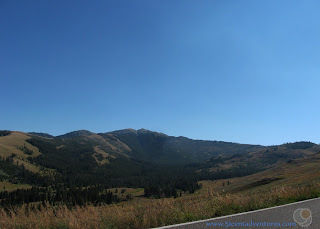 In the background on the left you can see the Grand Canyon of the Yellowstone. Straight ahead you can see the Hayden Valley. The room had pictures with the mountains labeled. We thought it was really funny when we found Antler Peak. My daughter made up a whole story about how that was where Antler was from and how her family still lived there. Eventually it was time to head back down the mountain. The kids did very well on the way down. Though they did drag a bit more than they had on the way up. The day was also much hotter by this point. We'd started our hike around 9:00 am. And reached the summit around noon. So hiking in the afternoon made it a lot hotter. We kept passing people heading up the mountain who only had a small supply of water. I wanted to go up to them and say, "turn back now or you'll regret it." But I was too shy. So instead I'll tell you, don't even consider starting the Mt Washburn trail after noon or bringing just one water bottle. You will have a bad day if you do. Recommendation: If you have the time, I highly recommend you do this hike. The 7 mile round trip distance of this hike is comparatively short for a mountain. The trail is inclined of course, but it's never ridiculously steep. 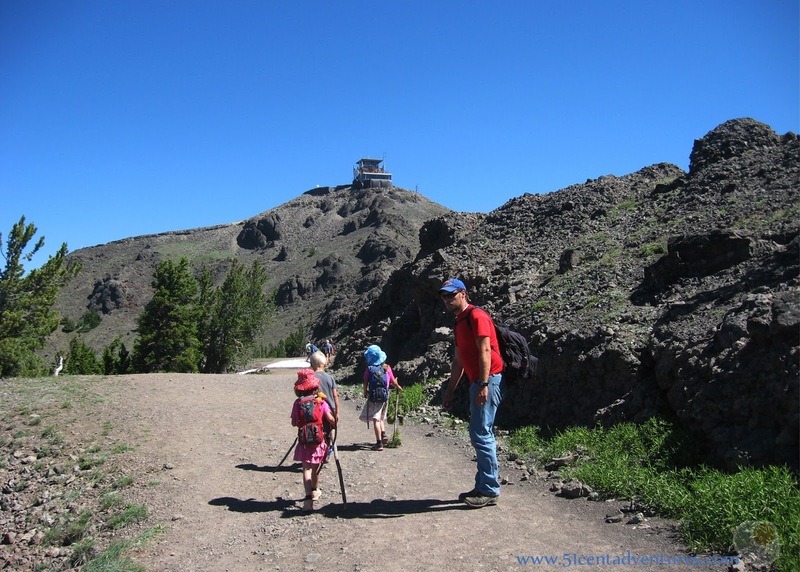 Climbing to the top of Mount Washburn is a great way to observe the landscape in Yellowstone. 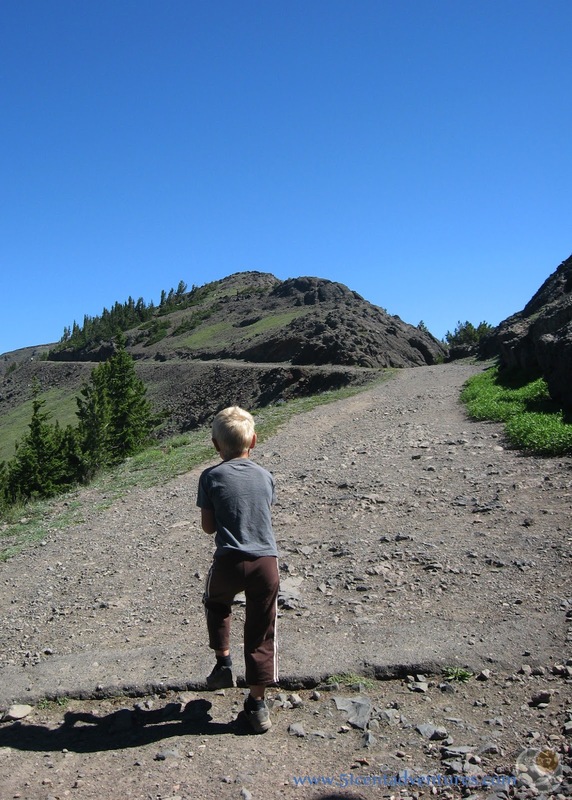 Directions: The trail head is located next to a parking lot in the Dunraven Pass on the Grand Loop Road. The parking lot is 5 miles north of Canyon Village. 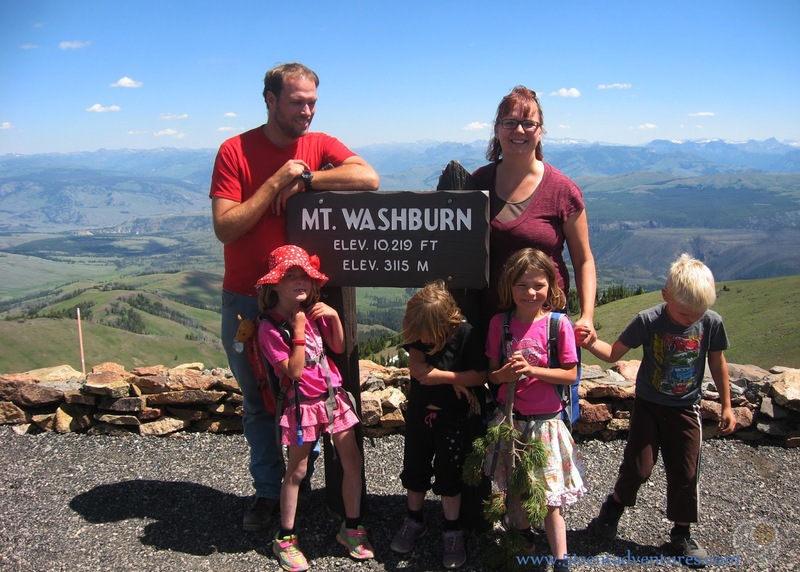 Places Nearby: Canyon Village is only 5 miles south of Mount Washburn. The Visitor Center has a large map of Yellowstone. It's fun to look at Mount Washburn on that map and see how much taller it is than the surrounding landscape.